This summer Zai Whitaker’s anthology of nature writing for young adults entitled The Rumbling Island: True Stories from the Forests of India was published by Penguin India. I’m honored to have had my piece on climbing Agasthyamalai included amongst writing by several of India’s most eminent naturalists, wildlife scientists and conservationists. My article was originally published in Sanctuary Asia in 2003, but I modified and edited it down for the audience of the book. Zai was personally acquainted with my antics and adventures in Kodai and encouraged me to include perspectives of growing up in the Western Ghats. Here is the book review from the Penguin Site. The forests of India are not only home to a wide variety of animals and birds, but they also teem with committed conservationists, naturalists and nature lovers. And after having spent many years with wildlife, these men and women have fascinating stories to tell. Cliff Rice is one such animal-explorer. He lived for two years in the mountains of Kerala, befriending the Nilgiri tahr, an endangered species of mountain goat, with fistfuls of salt. Ralph Morris, one of the first British coffee planters in the Biligirirangan Hills, went on a ‘tiger beat’ and chased a pair of tigers towards his daughter Monica , who was given little pebbles to throw at them if defence became necessary. Sally Walker spent years with tiger cubs in zoos, and proved that kindness is more effective than fierce authority; Rom Whitaker set off on an international hunt for giant crocodiles, which took him from Orissa to Egypt; and Manish Chandi tells a fascinating tale about Meroe, the rumbling Nicobar island, where he studied sea turtles and other wildlife. Zai Whitaker, herself a nature-writer and author of well-loved children’s books, brings together in this collection the writings of such eminent wildlife experts as Ramachandra Guha, Bittu Sahgal, Ian Lockwood, George Schaller and many others. 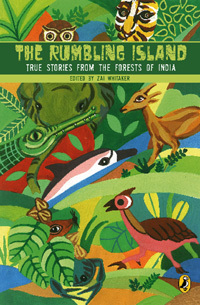 Filled with anecdotes that are at once incredible and informative, The Rumbling Island and Other Wildlife Stories is an entertaining account of India’s most precious national asset—our forests. Rohini Ramakrishnan has reviewed the book for the Hindu’s Young World.